Born in Nigeria, Eniola’s family moved to England when she was just one year old. 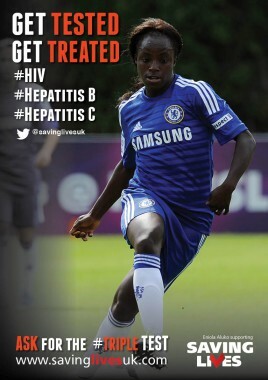 As well as representing her adopted country at international level, she currently plays for Chelsea Ladies as a centre-forward. 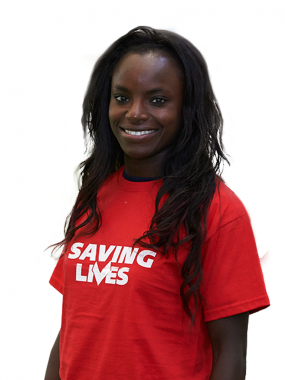 Her clever, sparky play is exactly the kind of fresh thinking we like to encourage at Saving Lives. 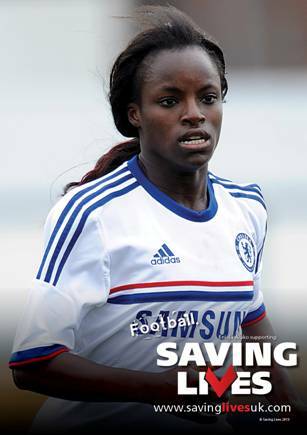 Aluko was named Young Player of the Year at the Women’s FA Awards in 2003. She left Birmingham to join Charlton Athletic in January 2004, and since then continued to show great promise. Pace is one of great her attributes and this was at the fore when she sprinted onto a through ball from Emma Coss to score the winning goal in the 2005 FA Women’s Cup Final at Upton Park. Aluko added to her growing reputation by scoring twice in Charlton’s 2–1 victory over Arsenal in the 2006 FA Women’s Premier League Cup final. 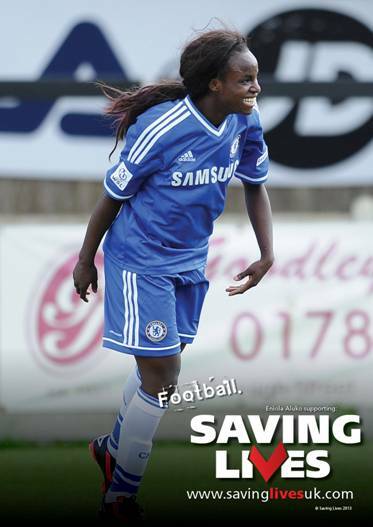 Following the withdrawal of support for the Charlton ladies team by the parent club, Aluko joined Chelsea Ladies in July 2007. In October 2008 Aluko’s Women’s Professional Soccer playing rights were obtained by St. Louis who named her as a post-draft discovery player. She was the team’s leading goalscorer for their first season with six goals, and also led in assists with four, making her one of the main reasons Athletica was able to climb from a last place in the first two months of the season to a commanding second by the end. She missed the playoffs and the All-Star game due to national team duty. When Saint Louis Athletica folded part way through the 2010 campaign, Aluko joined Atlanta Beat. She was traded to Sky Blue FC in December 2010.